This listing is for one GENUINE NEW KATE SPADE MARBLE HILL RAFAELA SHOULDER BAG - STYLE # WKRU2377 - BRIGHT BAZOOKA PINK - NEW WITH TAG. 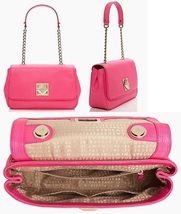 The main color for this bag is Bright Pink leather body, leather trims strap, w/ Gold color hardware. All metal parts are 14-karat light gold plated hardware. This shoulder bag from Kate Spade is New, Never Been Used, with their tags still on. The MSRP for this style is US398.00 sales tax. Description of this style is: split cowhide leather with matching trim custom woven Kate Spade New York lining 14-karat light gold plated hardware shoulder bag with flap top and pyramid turn-lock closure interior zipper pocket and double slide pockets designed for Kate Spade New York strap drop length is 10.1" 7" (H) x 10.9" (W) x 3.3" (D) This bag is newly acquired, definitely New, Never been used. All the leather and metal parts are in New, and Unused Condition (as in no sign of worn, tear, or scratch). This bag is not returnable once it has been shipped out. It will be shipped out together with its price tag still hanging from the bag, Kate Spade care card, and Kate Spade dust bag. PLEASE NOTE THAT SHIPPING CHARGE SHOWN FOR INTERNATIONAL BUYERS IS FOR INSURED INTERNATIONAL PRIORITY MAIL. Payment Shipping Terms: All payments should be in US currency. If there is a problem in making payment, please email us to let us know. Payment methods accepted are: PayPal: super_cheah@hotmail.com Credit Card payments via PayPal e-Check via PayPal (takes 5-7 days to clear to from your PayPal account to my PayPal account). Will ship once e-check clears account. Money Orders (in USD) from U.S. Postal Office * Domestic Shipping rules: Shipping will be by either USPS Priority mail, USPS Express Mail, or USPS Parcel Post, with delivery confirmation and insurance fee included. Buyer will need to choose and pay for the method preferred. Tracking numbers will be emailed to the email address provided by buyer (through PayPal payment email address). * International Shipping rules: International shipping will be by International Priority Mail, with Insurance fee included. Please note that SHIPPING TRANSIT TIME ONCE MERCHANDISE IS SHIPPED OUT IS NOT THE RESPONSIBILITY OF THE SELLER, as there is no way for me to tell the shipping carrier to hurry up or slow down their trucks or planes carrying the merchandise to be shipped to the buyer. THE ITEM THE BUYER WILL BE RECEIVING IS THE SAME ITEM AS SHOWN IN THE PICTURES.